The International Sign Association (ISA) is devoted to supporting members of the signage industry by providing quality education, training programs, extensive resources and industry networking events. ABC Signs is committed to continuing their education to become an even better vendor for the Cincinnati, Northern Kentucky and Eastern Indiana region. The Midwest Sign Association (MSA) is a regional trade association servicing Ohio, Kentucky, Michigan, Pennsylvania, & West Virginia. It promotes good design, better building codes and aesthetic sign integration. 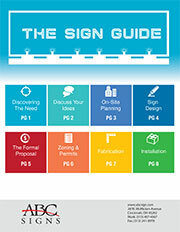 ABC Signs is proud to be a member of such a forward thinking organization.